A Turbo System Proven By World Record Setting Results! 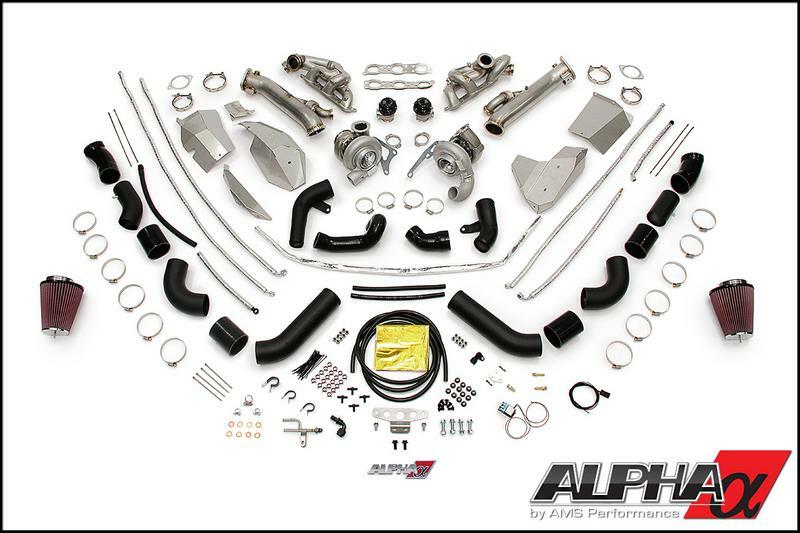 The Alpha Series Turbo System has powered us to every record for the Nissan GT-R platform. From quarter mile to standing mile to top speed, the Alpha Turbo System has been behind every World Record we have broken and still hold today including Alpha Omega’s latest accomplishment of being the first 7 second R35 GT-R. The Alpha GT-R Turbo System is no one-trick pony. Often bigger turbos require you to give up much of the low and mid-range power. While others might use the “bigger is better” approach to turbo kit “design”, we set out to properly engineer a system that yields maximum power across the WHOLE power-band to keep you ahead of the competition. By applying the latest in billet wheel and V-band turbo technology we set the bar even higher. Billet compressor wheels are not only lighter, which helps quicken your turbo spool time, they also have superior aerodynamic profiles that compress more air efficiently: less heat = more power. By applying cast stainless steel construction, we eliminated the restrictive design geometry and the possibility of cracking found with hand-fabricated headers. Hand fabricated, equal length tubular manifolds perform well but are prone to cracking because they have many joints that can easily become points of failure. These manifolds are typically found on purpose-built race cars where consistent dis-assembly and inspection are the norm and are not well suited for a street vehicle. There is a reason OEM manufacturers use only cast construction; it is much stronger and has an almost indefinite life span. Given the labor intensive job of removing the engine to change your GT-R turbos, it is simply not worth the risk of having to do the job twice to make repairs down the road on hand fabricated, tubular manifolds. 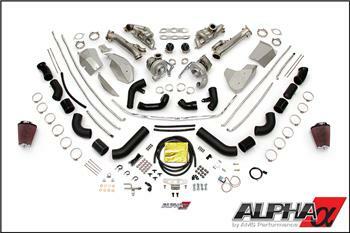 The Alpha GT-R Turbo Kit has proven time and time again to offer you maximum performance and rock solid reliability. In 2015 Catesby Jones and his Alpha 10 GT-R dominated the One Lap of America conquering over 3200 miles and 7 days of racing without incident taking home the overall win. The Alpha GT-R Turbo Kit has also powered the Lyfe Motorsport Team to countless victories and the 2014 Global Time Attack Unlimited AWD Championship Title. When it comes to performance and reliability, Alpha is the only choice for your GT-R! When it comes to casting, those aftermarket companies who are willing to make the investment, choose a log-style manifold due to its simplicity and smaller size. These are much easier and cheaper to produce because little effort is spent in the “design” of them. While log manifolds are much stronger than a hand-fabricated design, they disturb exhaust flow and hurt performance. Our team of engineers designed the Alpha manifolds with a cast AND tubular design giving you the best of both worlds. By implementing CAD (computer aided design) methods our turbo system offers you even better performance benefits than an equal length, hand fabricated manifold with the strength of a cast manifold; something not offered by our competition. By casting a computer designed, tubular manifold, we were able to maximize exhaust flow with massive 1.5” exhaust runners while utilizing the small space available in your GT-R’s engine compartment. To top things off, we even Extrude Hone each manifold to ensure you unmatched performance. Unlike other turbo kits on the market which require you to hammer your frame rail for clearance, the Alpha 10 system fits perfectly in the tight confines of your GT-R’s engine bay. Our engineering team went through painstaking measures to make sure you don’t have to hack up or permanently mangle your prized possession by designing a kit that fits properly. With the cramped GT-R engine bay, the added heat associated with higher power output becomes an issue. Not only does our cast tubular exhaust manifold design give off less heat, it gave us the necessary space to offer the most comprehensive heat shielding found on any GT-R turbo kit on the market. In addition, all of the oil and coolant lines are shielded in protective sleeves making the Alpha GT-R Turbo System the safest and most reliable available. When it comes to your GT-R, why chance it?